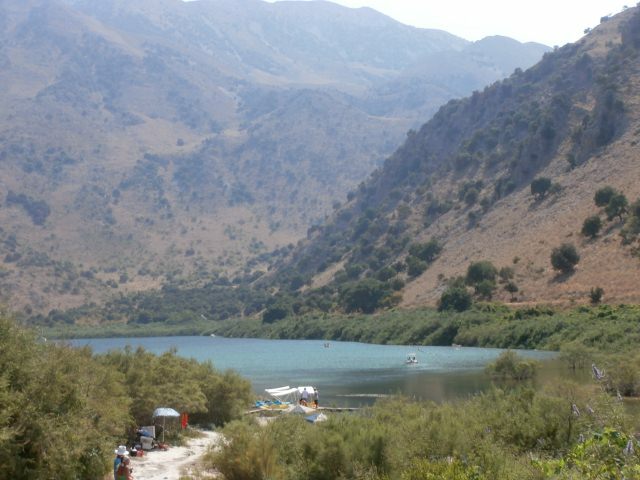 Kournas Lake is the only freshwater lake in Crete. 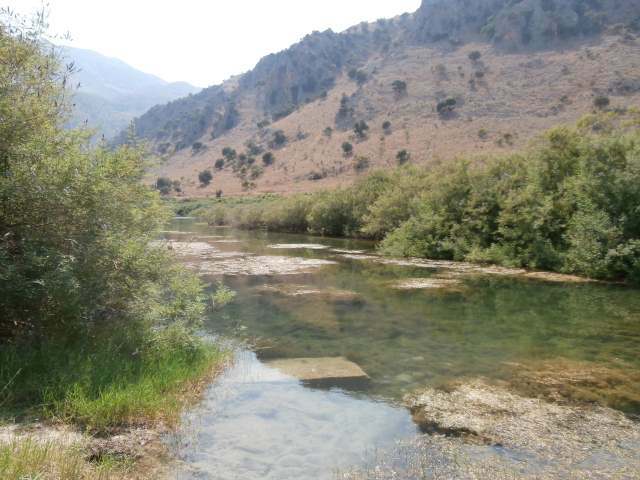 It lies in a small valley among mountains and high hills, near the village of Georgioupolis, 43km east of Chania and 20km west of Rethymnon city. 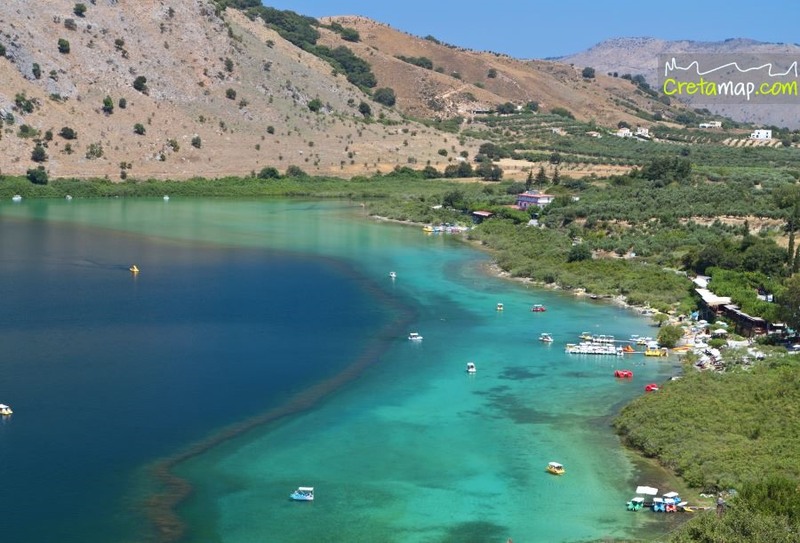 The lake used to be called ‘Korisía’ after ancient ‘Korion’, a city thought to be in the area with a temple dedicated to Athena. It later took its current name from the Arabic word for lake. 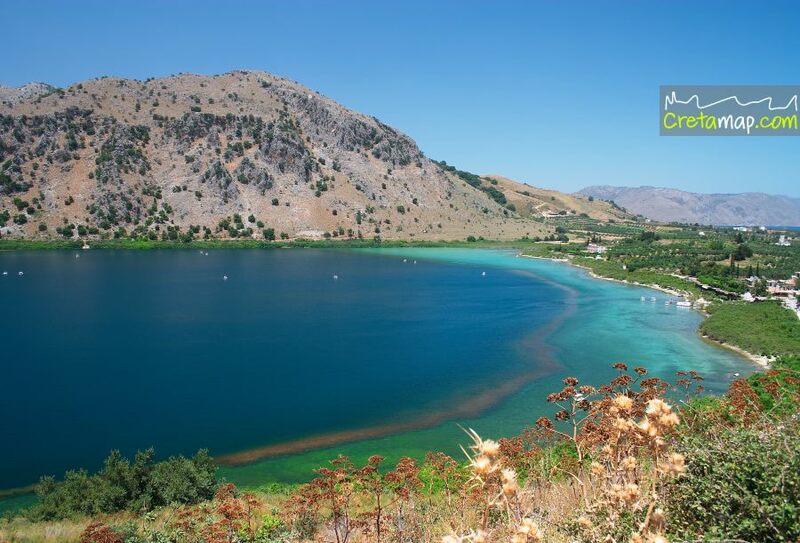 Lake Kournas is relatively small, with a maximum length of 1,087 m and a maximum width of 880 m.
It covers an area of 579,000 sq. m. and is 22.5 m at its deepest point, although it is supported that in certain points the lake is more than 40 metres deep. It lies approximately 20 m above sea level and its perimeter is about 3,5 kilometres. 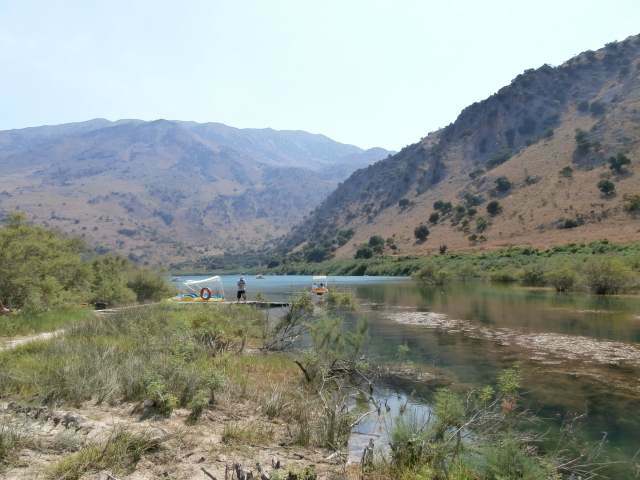 The lake is fed by water coming from the nearby White Mountains outpouting from two springs on its southeast bank. One spring called the Mati or Amati ( eye in Greek ), is visible in late summer and hidden below the surface during winter. There is a second spring which is always underneath the surface of the lake. 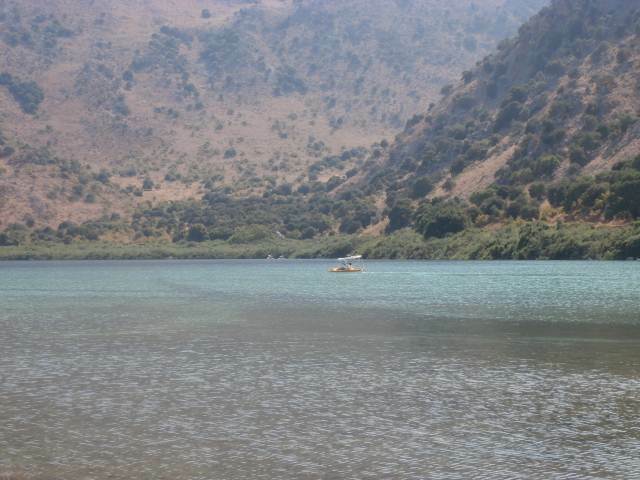 Lake Kournas and its surrounding hills are very picturesque with abundance of fresh water throughout the year. 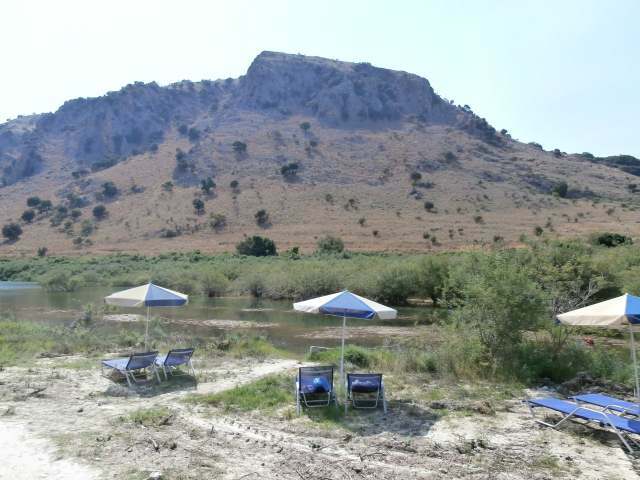 The lake is a protected area by the Natura 2000 Network due to many rare species which find shelter there. It used to be full of eels and now hosts mostly ducks, water snakes, a rare species of terrapin, occasionally herons and cormorants. The dark color of the water is caused by seaweed. A small sandy strip appears at the shore in summer, while in winter the nearby trees and bushes sink under water. There are several legends concerning the creation of the lake. The prevailing one has it that in place of the lake there once was a village where a beautiful girl lived with her father. One day they were resting at the whereabouts of the lake. The father, bewitched by his daughter’s unparalleled beauty tried to seduce her. The girl in her despair asked of the spirits to flood the area and she would become a ghost in return. Immediately the ground shook and flooded with water, forming a lake. The locals in the old days stated that many visitors have seen a water nymph sitting on a rock in the middle of the lake, combing her hair on moonlit nights. They say this water nymph takes care of the creatures living in the area. The second legend about the creation of the lake and its nymph states that God drowned the village in punishment for the villagers’ sinful behavior and thus the lake was created. The only resident to survive was the priest’s daughter, who can still be seen combing her hair on a rock in the lake. 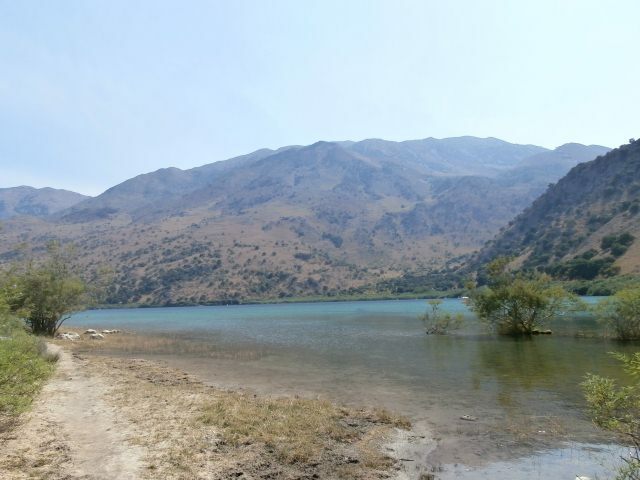 Lake Kournas is a highly recommended destination for a relaxing afternoon walk or a day trip. During summer months, a stroll around the two thirds of the lake lasts less than an hour. If you visit the lake in winter or spring though, bear in mind that the water rises as far as the steps down from the road, so the above mentioned stroll is not possible. You will find sun loungers and umbrellas on its banks where you can feed the ducks, while you can also rent pedalos if you want to explore the lake. You can also dine in one of the many taverns and cafeterias where you can eat beside the lake and enjoy the lovely view of the White Mountains reflected in the mirror-like waters. 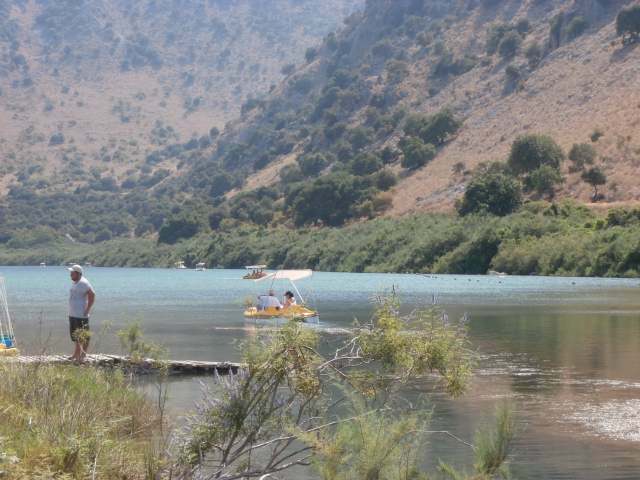 Lake Kournas is easily accessible from Georgioupoli village by taking the country road. 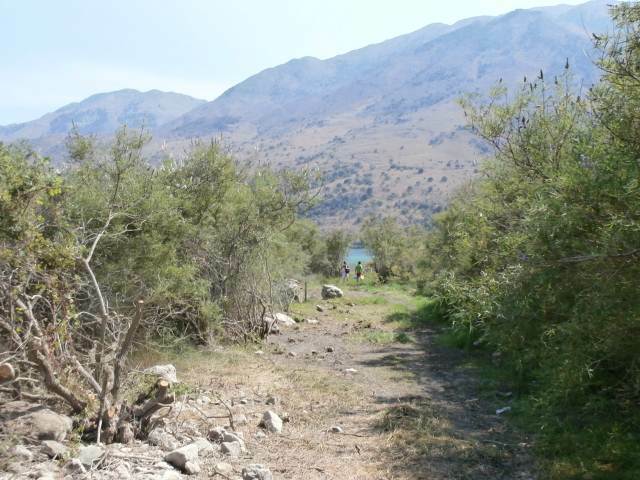 About 500 m before reaching the lake, there are two signs pointing straight ahead or right but you can approach the lake taking either direction. 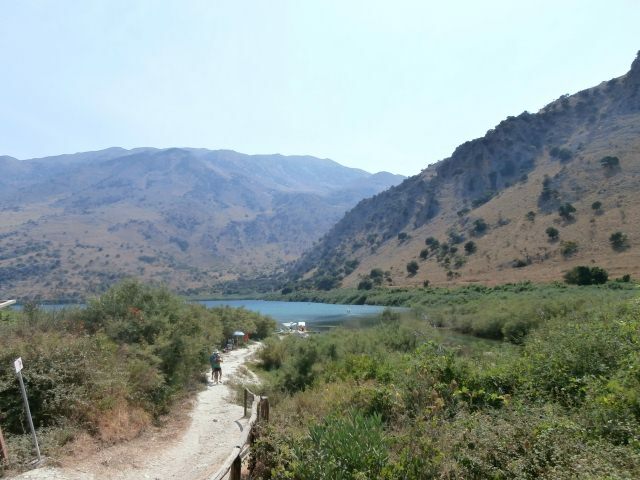 If you want to reach Kournas lake from the National Highway Chania-Rethymnon, drive carefully since the road is not very well signposted. 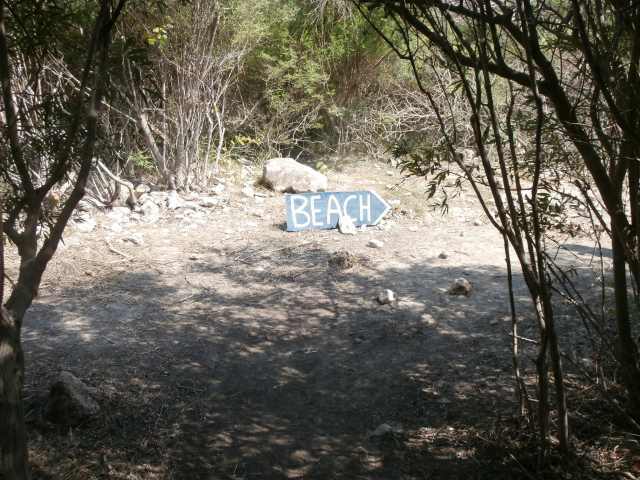 There is a sign for Kournas village, which leads to the lake, little before the turn to Georgioupoli on road Ε75.